The Briscoe Western Art Museum, named in honor of the late Texas Gov. 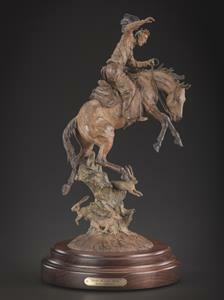 Dolph Briscoe Jr. and his wife, Janey, preserves and presents the art, history, and culture of the American West through engaging exhibitions, educational programs, and public events reflective of the region’s rich traditions and shared heritage. Located at 210 W. Market Street along the San Antonio River Walk, the Museum’s campus includes the restored 1930s former San Antonio Public Library building, which now serves as the Museum space with nine galleries on three levels; the three-story Jack Guenther Pavilion, used for event rentals and programs; and the outdoor McNutt Sculpture Garden. For more information about the Briscoe Western Art Museum, visit BriscoeMuseum.org, or follow us on Facebook/Twitter/Instagram @BriscoeMuseum.